ArenaNet has just released the “April 2014 Feature Pack,” the first-ever Guild Wars 2® update dedicated exclusively to adding and enhancing game features. The “Feature Pack” represents ArenaNet’s move towards releasing content updates that are focused on features and game systems. Going forward, these packs will be separate from the studio’s living world releases, which have primarily been the vehicle for introducing new storylines and story-driven game play. Just as with living world, feature packs and all new content added to Guild Wars 2 are available to players free of charge and without a subscription fee. One of the biggest updates in ArenaNet’s highly anticipated inaugural “Feature Pack” is the introduction of a megaserver system. The system makes it easy for people to find game maps populated with friends, guild members and similar players. Other major new features in the pack include a new wardrobe system, dozens of new traits, and upgrades to PvP. The new content touches on game play, quality of life and social play, meaning what’s being implemented today promises to enhance the experience of every player in Guild Wars 2. Megaserver System: ArenaNet’s megaserver technology is designed to intelligently bring players together to enrich the open world experience of Guild Wars 2. This system dynamically opens and closes maps to accommodate player activity while bringing players from different home worlds together. As part of these exciting changes, ArenaNet is restructuring the schedules of its open world boss encounters and allowing guilds to kick off the most challenging events to be found in the world of Guild Wars 2. Traits Unleashed: ArenaNet is introducing 40 new traits which will impact every trait line of every profession. The acquisition of traits is changing. Players will no longer have to pay to unlock trait tiers, but will be rewarded with new tiers as they reach the appropriate level. To round out the update, players can now unlock traits through feats of bravery and daring – a whole new horizontal progression system that allows players to customize their character’s build through gameplay. Account Wardrobe: The Account Wardrobe system makes it easy to customize the look of all your characters by sharing cosmetic items across your entire account. 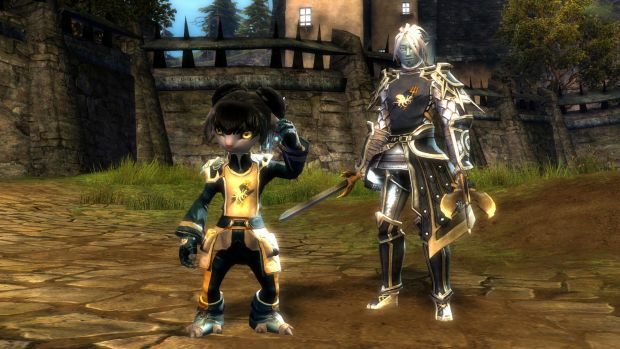 Every skin you unlock in Guild Wars 2 will now be accessible to each and every character on your account. Additionally, dyes will become account unlocks, making it simpler than ever to find just the right shade for every character. PvP Reward Tracks and Gear Unification: As part of the Wardrobe system, the idea of PvP weapons and armor will go away. Each player will keep their look consistent across PvE and PvP, although players will continue to be on a statistically even playing field in competitive PvP. As part of this update, ArenaNet is introducing PvP Reward Tracks, which allow players to choose which rewards they’re working towards. These rewards can be anything from dungeon weapons and armor sets to region-specific drops from Tyria, and even the building blocks of Legendary weapons. Social, Balance, and Account Updates: With significant rune and sigil updates, Looking For Group tool improvements, critical damage balancing, and account-bound Ascended and Legendary items, the features in the “April 2014 Feature Pack” will bring exciting changes to every part of Guild Wars 2. The core gameplay focuses primarily on moderately paced, up front action. With multi-stage objectives to focus on.